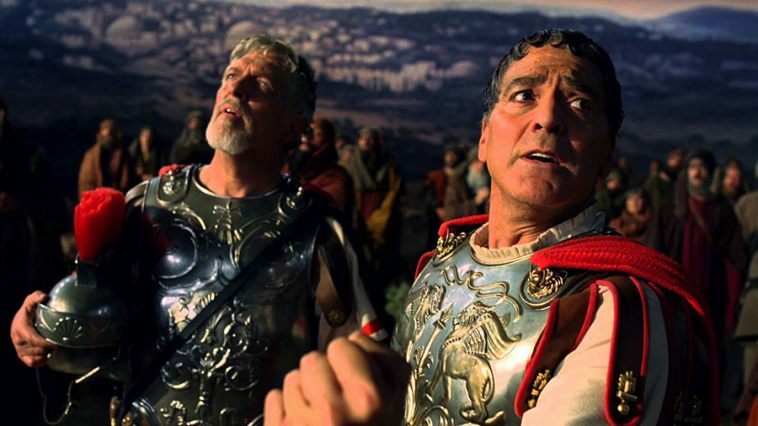 As a straight narrative, “Hail, Caesar” by the Coen Brothers represents a shocking misfire of intent, but as a collection of scenes that offer a slice of their infectious wit, it is an exercise in some of the most delightful chuckles of recent memory. How rare to arrive at the embrace of so much joy and enthusiasm in the midst of a perpetual nothing of a plot. It’s not as if there wasn’t an underlying set of values going for it all, either; set in the days of old Hollywood when the concept of movie illusions kept us at bay from the realization that pigs and idiots could populate the sets of our treasured epics, there is a great sense of comic awareness running through every scene – not cynical or insulting to the legacy of the craft, but certainly cognizant of the strange motives of the puppet masters. A wide array of sequences showcase these ideas to the peak of possibility, and like eager schoolboys these dependable filmmakers wrap them in a subtext that disregards seriousness, embraces the absurdity and caps it all off in a show of charm and wisdom. It’s just that pesky nuisance of a story that seems to louse it all up. Of course you may be contemplating the rhetorical argument: what does it matter if the experience offers exactly what it must? The simple answer is that it doesn’t have to, assuming you are forgiving of fragmented indulgences. But “Hail, Caesar!” is not directly set up that way. It isn’t a straightforward journey into the daily routine of characters, nor is it just farce with jovial purpose. 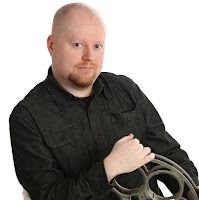 The movie is filled with setups, conflicts, twists and intrigue that appear as if leading to something grandiose, and yet never quite arrives there to address them (either as conclusive statements or red herrings). The agenda of the filmmakers, so ordinarily calculated and precise, seems lost in a labyrinth of sarcasm that gets too far ahead of itself, content to leave behind a story arc that gets going and then… just putters out. Many (perhaps a majority) will use the endeavor to rediscover the humorous purity of the creators; I was too busy mourning the loss of a rewarding outcome. What exists to serve as a plotline involves a cluster of characters moving urgently through the sound stages of Capital Pictures, a large movie studio in Hollywood in the early 1950s. The scene is one of zany simplicity, of people and situations not yet tarnished by the effect of McCarthyism; they exchange glances and dialogue and questionable behavior not like opportunists, but like simpletons completely removed from the importance of their profession. Those antics are watched over earnestly by Eddie Mannix (Josh Brolin), a studio executive charged with ensuring that productions on site continue moving along without any hiccups – internal or otherwise. But when an aloof lead star of the costly epic “Hail, Caesar!” goes missing from the set without a trace, it rouses him to a crossroads: is he cut out for the inevitability of what this new pursuit will require of him, or are the demands of a family life calling him away from the structure of the industry and into the embrace of another? As he grapples with these internal deliberations, a vortex of strange personalities drift consistently in and out of his sphere with personal conundrums. One of the studio’s most reputable directors, Laurence Laurentz (Ralph Fiennes), is at odds with the lead on the set of his latest musical, for example; often the headliner in westerns, young Hobie Doyle (Alden Ehrenreich) just isn’t cut out for more distinguished material, and works through takes like he is passing kidney stones instead of properly annunciating the script’s lines. Hobie, meanwhile, agrees passively with the studio’s decision to offer him new choices but contemplates the point; why are they trying to change his image at all when the one he owns has proven so lucrative already? The beautiful DeeAnna Moran (Scarlett Johansson), a star of water ballet pictures, is in danger of turning the heads of the press unless she marries a man to cover up her illegitimate pregnancy, but her motor mouth and questionable standard are at odds with Mannix’s persistent recommendations. And poor Baird Whitlock (George Clooney), the A-list actor who has been kidnapped by a group of unemployed communist writers, is so highly regarded by his superiors that his absence comes to the immediate notice to a set of twin gossip columnists (Tilda Swinton), each of whom threaten to run damning stories unless someone at the studio grants them access to the juicy truth. Life isn’t easy for poor Mannix, and with good reason; the utter absurdity of the conflicts thrown at him represent a tandem of ongoing confusion, generally reserved for those who are not perceptive enough to understand the possibilities of the industry they are working in. Some directors and writers could have easily used the approach to funnel in their own cynicism, but the Coens do not bother with such cheap suggestions. Theirs is an outlook that admires both the joy and the hypocrisy of the moviemaking enterprise, and they find great pleasure in emphasizing the absurdist nature of these characters as they do highlighting the work ethic of the lead, who remains stone-faced in nearly all encounters he is thrust into. That gives us a pass to laugh at moments that might not have seemed as funny otherwise, and the handling of a plethora of silly sequences (including my favorite, a musical number staged with sailors) lift the movie’s surface implications to something of consistent awareness. The politics of this closed world can be both hellacious and chaotic, but gosh darn it, it’s the only world they know, and how marvelous it must be to know that all the strange quandaries will, maybe, possibly, lead them to the upper echelons of motion picture history (or something like that). The flip side of that argument also serves to criticize the movie’s strange sense of focus, which ultimately derails the story it is attempting to tell. There isn’t even a chance for the Coens to suggest an optimistic impression; many of their characters (memorable ones, to boot) only drift into the picture long enough to utter a few lines of personal nonsense, and then wander off into the background like extras in their own screenplay (the minimal use of the Johansson character, for example, is particularly glaring). Some of that might have been okay if a central arc required more of the emphasis, but it does not. The Brolin character has no lasting distinction of his own – only participation in the antics of others, really. 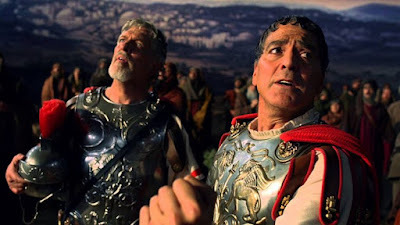 And the recurring conflict involving the kidnapping of Whitlock (and the subsequent completion of the time sensitive “Hail, Caesar!”) is so passively tackled that there isn’t even a rewarding resolution: only a scene where he is back on set, pushing his words out with new insight and conviction while all those around him seem to already be bored before the final wrap. What a strange reality this is for the Coens, who are ordinarily so ferocious and irreverent in all aspects of their movies, including the creation of an arc that can support the relevance of their humor. Will the movie follow the trajectory of their most treasured output? Financially speaking, they are in good standing; the studio was wise to release the film in the dead of the winter, when all of the new releases have little going for them beyond a fleeting week or two of success at the box office (especially while audiences are still catching up on the obligatory Oscar contenders). Among the menagerie of films they have released in 30 years, most of them have sustained momentum with audiences, especially in times of relative silence. And even now, one can always depend on the inevitability of a distinctive experience of attending the latest of their endeavors. No one makes movies quite like them. But what will “Hail, Caesar!” really mean to anyone ten years from now, when movies like “Fargo” and “The Big Lebowski” still resonate in the eyes of their fans? A sense of humor endures better when we can attach it to characters or situations that deal in more lasting impressions. "as a collection of scenes that offer a slice of their infectious wit, it is an exercise in some of the most delightful chuckles of recent memory. How rare to arrive at the embrace of so much joy and enthusiasm in the midst of a perpetual nothing of a plot." So I conclude you liked the movie, on the whole, and in fact gave it an above average rating of 2 1/2 out of 4. So why is your review on the tomato site listed as a negative? I saw the film yesterday and, while I really enjoyed the beginning, it soon dawned on me that it wasn't going anywhere and it wasn't going to go anywhere. I tried to enunciate to myself exactly what was wrong with the picture and began reading through reviews to get a grasp on it. I think your review out of all that I have read so far hits closer to the truth than any other. There are some beautiful set pieces in the film and some tantalizingly interesting characters, but it never comes together.